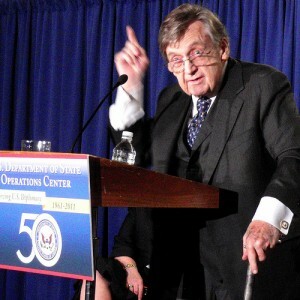 June 8, 2011: Lawrence Eagleburger’s death on June 4 took away one of the giants of American diplomacy, as well as one of the great characters of the U.S. Foreign Service. Generations of U.S. diplomats were professionally reared on Eagleburger stories. He inspired terror, admiration and pride in more or less equal parts. His concern for South Asia was ordinarily limited, but he left his imprint – and some great stories – nonetheless. Afghanistan in the years of Soviet occupation was a major policy priority for the United States, and hence an important item on the Eagleburger agenda. Howard Schaffer recalls traveling with him to a camp for Afghan mujahidin and refugees near the Khyber Pass in the early 1980s, where as undersecretary for political affairs he gave an unusually emotional speech that contrasted with the rather blasé attitude he displayed at his other stops in the subcontinent. He was genuinely moved by what he saw. The limited nature of Larry’s interest in South Asia quickly resurfaced the next day, however, at an Islamabad dinner in his honor hosted by Ron Spiers, the U.S. ambassador to Pakistan. As senior Pakistan government officials and politicians eagerly sought his ear, Larry spent most of the evening in earnest conversation with the Yugoslav ambassador discussing that faraway Balkan country’s problems in the immediate post-Tito years. His American host could not have been amused. Nor were the Pakistanis. Eagleburger could move the U.S. government’s recalcitrant system. When Bangladesh was submerged by floods in 1991, it was Eagleburger who managed to persuade the Defense Department to divert a helicopter carrier from the Persian Gulf to Dhaka on its way back to the Pacific. The cable of instructions to the skipper said, in a wonderful Pentagon expression, that the Defense Department was to “capture the costs.” Operation Sea Angel, as it was known, was one of the high points of U.S. relations with Bangladesh, a decisive demonstration of U.S. skill and good will.